Securitizations of Citizenship investigates how the fate of citizenship is now caught up in a dramatic and dangerous process of securitizing political communities. In the nervous state of affairs of the post-9/11 period, technologies of surveillance and control are rapidly proliferating, creating severe constraints for the enactment of citizenship practices. While citizenship has always faced the problem of exclusiveness, the contemporary relationship between security, territory, and population is being transformed in ways that are creating new dynamics of exclusion for citizens, non-citizens, and quasi-citizens alike. 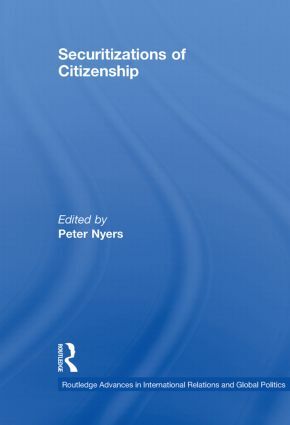 This book assesses a variety of citizenship practices in relation to the emergence of forms of governance that are responsive to – and constitutive of – fears, anxieties, and insecurities in the population. At the same time, the book identifies and assesses citizenship practices for how they can mobilize progressive forces to militate against the nervous, anxious and fearful subjectivities instigated by newly securitized sovereignties. In the critical spaces between inclusion and exclusion, migration and mobility, security and surveillance, reason and neurosis, biopower and sovereign power, the contributors to this book reflect upon the possibilities and constraints for refiguring citizenship today.